Many nurses—even experienced ER and ICU nurses—are uncomfortable caring for a patient who has taken an overdose. Toxicology is often more art than science, and there is often a limited amount of easily available information a busy nurse can use for practical advice. Also, poisoning emergencies are far less common than medical emergencies such as myocardial infarctions and cerebrovascular accidents, and without a background of hands-on experience, comprehensive care is difficult. This activity will provide nurses with the knowledge they need to provide comprehensive care for a patient with an overdose. This activity will stress that taking care of the poisoned patient requires specific knowledge, but also flexible and creative thinking. This course is designed for nurses who may care for patients who have taken an overdose or who have unintentionally been poisoned. NetCE designates this continuing education activity for 5 ANCC contact hour(s). NetCE designates this continuing education activity for 3 pharmacotherapeutic/pharmacology contact hour(s). NetCE designates this continuing education activity for 6 hours for Alabama nurses. NetCE is authorized by IACET to offer 0.5 CEU(s) for this program. AACN Synergy CERP Category A. The purpose of this course is to provide information regarding the most common poisoning emergencies and their treatments to ensure that these cases are identified and treated early, resulting in better outcomes and improved patient care. Evaluate indications for interventions to stabilize the poisoned patient. List drugs/toxins with unique properties, such as low toxic doses and delayed effects, that may affect patients' clinical presentation. Identify toxidromes and their associated signs and symptoms. Outline laboratory and other testing that may be useful when assessing the poisoned patient. Compare and contrast various gastric decontamination techniques. Compare antidotes and indications for their use. Analyze the care for common dermal, ocular, and inhalational exposures. Dana Bartlett, RN, BSN, MSN, MA, CSPI, is a Certified Specialist in Poison Information. He worked at the Poison Control Center in Philadelphia as a hotline operator from 1993 until 2011. From 2011 to the present, he has been working as a hotline operator at the Connecticut Poison Control Center. Mr. Bartlett received his BSN from the University of Massachusetts, Amherst, in 1976; his MSN from Boston University in 1978; and his MA in journalism from Temple University in 1988. His clinical experience includes 6 years as an ICU nurse and 10 years as an ER nurse. He has authored more than 100 continuing education modules for RNs and allied health personnel, and he has been published in Nursing Magazine, OR Nurse, Journal of Emergency Nursing, Legal Nurse Consultant, American Nurse Today, Journal of Emergency Services, and Orthopedics Today. He has also authored textbook chapters and NCLEX material and has edited and reviewed for several major publishers. Contributing faculty, Dana Bartlett, RN, BSN, MSN, MA, CSPI, has disclosed no relevant financial relationship with any product manufacturer or service provider mentioned. Many nurses, even experienced emergency and intensive care nurses, are uncomfortable caring for a patient who has taken an overdose. This is not surprising, as poisoning and overdose emergencies are far less common than medical emergencies such as myocardial infarctions (MIs), cerebrovascular accidents, or traumas. Toxicology is not covered extensively in basic or advanced nursing textbooks, and treatment recommendations for nursing care of poisoning emergencies are often based on a small number of anecdotal reports. Protocols can be frustratingly vague. Lack of experience, lack of education, and lack of information make caring for the poisoned patient an unsettling challenge for many nurses. However, any experienced nurse has the skills to do it. Caring for a poisoned patient is no different than any other clinical situation; it is based on assessing the patient and making a plan of care. The difference is that these clinical challenges demand a slightly higher level of flexibility and adaptability. But it is important to remember that more poisoned patients have been saved by skilled attention to their basic needs than by using specialized procedures or antidotes. In 2017, the American Association of Poison Control Centers reported more than 2.1 million calls to poison control centers that involved a human exposure; most cases did not result in serious harm, but there were 1,977 deaths . Although many poisonings are managed by emergency nurses, transport staff, and poisoning specialists, these events can occur in a wide variety of settings. Therefore, all nurses should have knowledge of the processes for identifying and treating poisonings or overdoses. Assessment, including evaluation of airway, breathing, and circulation (the ABCs). Obtain a history and perform a physical exam. Determine what toxic effects may be caused by the drug, poison, or other toxin. Perform gastric decontamination, if indicated. Obtain laboratory and diagnostic tests. Use an antidote, if indicated, and/or deliver specific care or symptomatic/supportive care. These steps are discussed individually but they can be, and many times are, essentially done at the same time. Also, aside from evaluating the ABCs, which is always the first step, the steps do not need to be performed in a specific order; the circumstances of each case will dictate what needs to be done and when. Simplified, the process is: assess and stabilize the ABCs, provide symptomatic and supportive care, administer an antidote if there is a need, and increase the elimination of or remove the poison. Begin the care of a poisoned patient by assessing the ABCs. In some cases of poisoning or overdose, there will not be significant and/or characteristic changes in the ABCs or the ABCs may be normal. However, there are drugs and toxins that can cause distinctive and serious derangements in the ABCs (Table 1) [2,3]. These changes in pulse, blood pressure, body temperature, and breathing can help confirm an ingestion or help identify what the patient has taken if the ingestion was not witnessed or if the patient is unconscious or incoherent. Many drugs and toxins can cause changes in the ABCs, but it is vital to remember no single change in one of the ABCs can be considered diagnostic. A 12-lead electrocardiogram (ECG) should also be obtained while the ABCs are being assessed. ECG changes and poisoning will be discussed in detail later in this course. In most poisonings, the British Thoracic Society recommends aiming at an oxygen saturation of 94% to 98%, unless the patient is at risk of hypercapnic respiratory failure. If the poisoned patient has a significant derangement in her or his ABCs, the first step is to provide supportive care. In addition, treatment measures that are considered standard for any patient should be instituted. Secure the patient's airway if it is compromised or may become so, and administer supplemental oxygen if the patient is hypoxic or ventilation is inadequate. If the patient is hypotensive and her or his lungs are clear, an IV infusion of 0.9% sodium chloride or lactated Ringer's solution should be used. Hyperthermia or hypothermia can be treated with cooling or warming measures. Some poisoned patients will require specific treatments or an antidote. For example, the patient who has taken an overdose of metoprolol and is hypotensive should be given an IV infusion of glucagon. The patient who has taken an overdose of heroin and has respiratory depression and inadequate ventilation requires naloxone along with oxygen. However, with very few exceptions, standard, supportive care is always the appropriate first choice for treatment. The coma cocktail is an informal term for four drugs that can be empirically used to treat a poisoned patient who has an altered mental status. These drugs—dextrose, oxygen, naloxone, and thiamine—are often referred to by the mnemonic DONT. The administration of dextrose, oxygen, naloxone, and thiamine (referred to as the "coma cocktail") was once considered to be standard care for poisoned patients with a depressed sensorium. These drugs are comparatively safe, but the routine use of the coma cocktail is no longer recommended [4,5]. As with any therapy, dextrose, naloxone, oxygen, and thiamine should only be given if there is an indication for their use and after careful evaluation of the contraindications, benefits, and risks. The use of these drugs and oxygen for a poisoned patient will be discussed in detail later in this course. When the ABCs have been evaluated and stabilized, a history and physical exam should be completed. The importance of obtaining a good history cannot be overstated. Inexperienced nurses often focus on what the patient took, but the circumstances of an overdose are just as important or more important. Knowing the circumstances of the poisoning is often the most overlooked part of caring for a poisoned patient. The first step in taking a history is determining what the patient took or was exposed to and how the poisoning occurred. Remember, the signs and symptoms and the clinical effects are determined by the pharmacology of the drug, but what is likely to happen depends upon the circumstances of the overdose. For example, an acute overdose of lithium carbonate can cause coma and seizures, but these effects are much more likely to occur if the patient has been taking the medication for several months, because the CNS tissues will be saturated with the drug. An overdose of a tricyclic antidepressant (TCA) (e.g., amitriptyline) can cause arrhythmias, hypotension, and seizures, but these effects always happen within six hours of the ingestion. The patient's age, her or his pre-existing medical problems, body weight, and other medications currently being taken can also strongly influence the clinical course of an overdose. Make sure that this information is obtained and documented. A patient may state that she or he has taken an overdose of aspirin, in which case serial salicylate levels should be obtained. But if this same patient has been diagnosed with bipolar disorder, determine if lithium has been prescribed and request serum lithium levels, if indicated. Some drugs/toxins can be dangerous if the patient has been exposed to a very small amount, some can have a delayed onset of effects, and some may seem innocuous because the patient's signs and symptoms may initially be minor, or he/she may be asymptomatic. A knowledge of these properties can be helpful when formulating a treatment plan. In addition, delayed effects commonly occur with the practice known as body packing or stuffing. This involves an individual ingesting or inserting sealed packets of illicit drugs (e.g., cocaine, heroin) for the purposes of trafficking or evading arrest. These packets can then rupture, causing acute toxicity many hours after ingestion. Obtaining a good history when caring for a poisoned patient can be difficult, and there is evidence (and considerable clinical experience) that the information provided by most poisoned patients about what they ingested, how much, and when is likely to be inaccurate [9,10,11]. The patient may be unable to provide information or may not accurately remember what she or he took. In some cases, patients may misrepresent the facts of the overdose or may only mention the parts of the situation that seem important to them. Every effort should be made to find out exactly what happened. Family members, friends, and emergency medical services (EMS) personnel can all be valuable resources when obtaining a history. The patient's medical records should be obtained as well. Many drugs and toxins can produce similar clinical effects, and providing basic symptomatic and supportive care is one of the most important aspects of caring for a poisoned patient. However, obtaining information about the specific effects of a drug/toxin and guidance about specific treatments is often necessary. Even a brief outline of the effects and treatment of all possible toxins is beyond the scope of this course. The best source for this information, which is critical for the care of a poisoned patient, is a poison control center. Poison control centers are open 24 hours every day, and dialing 1-800-222-1222 will connect to the closest poison control center. The centers are staffed by certified specialists in poison information (CSPIs). Most CSPIs are nurses or pharmacists who have received special training in clinical toxicology. They use a computer database (Poisindex) that has millions of entries and up-to-date information about drugs, chemicals, natural toxins, and household and personal care products. CSPIs can provide information regarding effects a drug or toxin may produce and specific treatment guidelines. The CSPIs at a poison control center can also contact a physician toxicologist; she or he can offer another level of expertise and experience and can provide a telephone consultation to the treating physician. Poison control centers also provide services to the public. The patient's age, weight, past medical history, current vital signs, and present condition should be noted prior to contacting a poison control center. In addition, it is important to have information regarding the basics of the case (e.g., what was taken, when, how much, if the ingestion was witnessed). The CSPI will need this data in order to make an assessment and a treatment plan. As always, the circumstances of an overdose are just as important as what was taken. When taken in an overdose, most drugs do not produce characteristic signs and symptoms, and the clinical presentation will be nonspecific. A patient who has taken an overdose of one of the commonly used psychotropics or sedative-hypnotics is likely to be drowsy and tachycardic, but there are many drugs that cause CNS depression and an elevated heart rate. However, some drugs do produce a distinct clinical picture; in toxicology, this is termed a toxidrome. A toxidrome is a set of characteristic signs and symptoms associated with an overdose or poisoning from a particular drug or toxin. Toxidromes can be used to confirm an ingestion or exposure. They are also helpful if a poisoning is suspected, but it is not clear what the patient has taken; in these situations, the presence of a toxidrome can narrow the number of possibilities. Not all medications or toxins produce a toxidrome, but there are many that do and being familiar with the toxidromes is important for assessing the poisoned patient. The most common toxidromes are categorized as anticholinergic, cholinergic, opioid, sedative-hypnotic, sympathomimetic, hallucinogenic, and serotonin [2,4]. The anticholinergic toxidrome is caused by drugs that block acetylcholine from binding to cholinergic receptors. The result is central and peripheral effects that include agitation, confusion, decreased bowels sounds, delirium, dilated pupils, dry and flushed skin, dry mucous membranes, hyperthermia, tachycardia, and urinary retention . In severe cases, arrhythmias, coma, and seizures are possible . Drugs that can cause anticholinergic toxidrome include antihistamines, antispasmodics (such as hyoscyamine), atropine, phenothiazines, TCAs (less commonly), and psychoactive plants such as Amanita muscaria (fly agaric mushroom) and Datura stramonium (jimson weed). The duration of anticholinergic signs and symptoms after a poisoning can be several days. The cholinergic toxidrome is caused by drugs and toxins that stimulate the cholinergic receptors. Patients with this syndrome present with bradycardia, bronchorrhea, diarrhea, emesis, lacrimation, miosis, salivation, and urinary incontinence [2,4]. Organophosphate and carbamate insecticides can cause the cholinergic toxidrome. Donepezil, a commonly prescribed drug used to treat Alzheimer disease, can cause cholinergic effects as well. Two mnemonic devices may be helpful to remember the signs of cholinergic toxidrome. The first is the acronym DUMBELS, which stands for diarrhea, urinary incontinence, miosis, bradycardia, emesis, lacrimation, and salivation. The other is the mnemonic SLUDGE, which is short for salivation, lacrimation, urination, defecation, and gastric emptying, but leaves out bradycardia and miosis. Note that in both cases salivation also refers to excess bronchial secretions. The opioid toxidrome is caused by drugs that stimulate the opioid receptors. It is characterized by CNS depression, hypotension, miosis, and respiratory depression [2,4]. Drugs that can cause the opioid toxidrome include codeine, fentanyl, heroin, methadone, morphine, oxycodone, and tramadol. This toxidrome is caused by drugs such as barbiturates and benzodiazepines that act by increasing the activity of gamma-aminobutyric acid (GABA), one of the major inhibitory neurotransmitters. The sedative-hypnotic toxidrome is characterized by CNS depression, delirium, mydriasis, and respiratory depression [2,4]. In addition to barbiturates and benzodiazepines, this toxidrome can develop with methaqualone (Quaalude) and anticonvulsants. Adrenergic receptors are directly stimulated. A drug or toxin stimulates the release of catecholamines. Synaptic reuptake of catecholamines is decreased. Signs and symptoms of this toxidrome include agitation, diaphoresis, fever, hypertension, mydriasis, and tachycardia [2,4]. Severe cases can cause arrhythmias, MI, and seizures. Amphetamine and cocaine are two commonly used drugs that can cause the sympathomimetic toxidrome. The hallucinogenic toxidrome is generally the result of ingestion of drugs or substances that result in an altered state of consciousness. The hallucinations associated with this toxidrome may be visual, auditory, or tactile . Although there are several categories of drugs/toxins that can result in hallucinations, the most commonly encountered are ketamine, illicit hallucinogens, including lysergic acid diethylamide (LSD), dimethyl tryptamine (DMT), mescaline, psilocybin mushrooms, and phencyclidine (PCP, or "angel dust"), and hallucinogenic amphetamines, such as 3,4-methylenedioxymethamphetamine (MDMA or Ecstasy) . Acute hallucinogen toxicity should be suspected in patients presenting with unexplained, acute psychotic behavior . Other presenting symptoms may include mydriasis, hypertension, tachycardia, tachypnea, and nausea and vomiting; however, the exact symptoms will depend on the substance ingested. Treatment is generally supportive, and care should be taken to ensure that the patient will not harm him/herself or others. A sedative may be used to decrease agitation or combativeness . The serotonin toxidrome, more commonly referred to as the serotonin syndrome, is caused by excessive stimulation of serotonergic receptors. Medications involved in the development of the syndrome act by inhibiting the reuptake of serotonin, causing the release of serotonin into synapses, directly stimulating serotonin receptors, or decreasing the metabolism of serotonin. It can also occur when a drug-drug interaction inhibits the breakdown of a serotonergic drug. Serotonin syndrome is characterized by autonomic, cognitive, and neuromuscular abnormalities [2,12]. Mild cases of serotonin syndrome present with signs and symptoms such as anxiety, diaphoresis, and gastrointestinal complaints. Severe cases can present with confusion, hypertension, hyperthermia, hyperreflexia, and seizures. The serotonin toxidrome has a variable presentation and can be difficult to detect; the signs and symptoms are similar to those seen in the anticholinergic and sympathomimetic toxidromes. The most distinguishing features are clonus, fever, and hyperreflexia, but the most important diagnostic clue is a history of exposure to serotonergic drugs. Selective serotonin reuptake inhibitors (SSRIs) are a common cause of the serotonin toxidrome, and some analgesics, antiemetics, anti-migraine drugs, and illicit drugs may cause the toxidrome as well. Most cases of serotonin toxidrome are caused by concurrent use or overdose of two or more serotonergic drugs . The levels of these drugs and toxins are (usually) quickly available and can be used to assess damage, predict toxicity, or help clinicians determine the need for treatment. However, in many cases, drug levels or toxin levels are not useful because they are not reliable as indicators or predictors of toxicity and/or the levels cannot be quickly processed and reported, so they are not useful for the management of an acutely ill patient. In addition, there is a risk of false positive and/or false negative results for certain drugs; this will be discussed in more detail later in this course. The urine drug screen is often used as part of a diagnostic workup in cases of poisoning, and most urine drug screens measure levels of several common drugs of abuse, such as amphetamine, cocaine, cannabis, and opioids. Using and interpreting the urine drug screen is complicated. Each screen has different sensitivity, specificity, time limit for detection, and amount of drug metabolite that can be detected, and they confirm prior use but not necessarily current intoxication. They may not detect other commonly abused drugs, including oxycodone and methadone, and false-positive and false-negative results are common [5,13,14]. For example, many of the commonly used urine drug screens will not detect alprazolam, clonazepam, or lorazepam, even if there has been a recent ingestion of one of these drugs, and antihistamines can cause a false positive for TCAs . Perhaps most importantly, there is little convincing evidence that urine drug screens used during the acute care phase of a poisoned patient have any significant impact on management or outcomes [15,16]. The laboratory tests needed to assess and evaluate a poisoned patient will depend on what the patient has ingested or been exposed to and the patient's clinical condition. If the drug or toxin responsible for the poisoning is unknown, one or several of the following tests may help determine what the exposure might have been. A single laboratory test is rarely sufficient to identify an unknown drug or toxin. Please note that the drugs and toxins associated with the laboratory abnormalities discussed in the following section are not the only ones that may cause changes. Rather, they are drugs and toxins that are commonly encountered and cause significant laboratory changes that would be a prominent part of the clinical presentation of a patient who has been poisoned. An arterial blood gas test can be used to detect and diagnose acid-base disturbances and hypoxemia. Acetaminophen (in severe cases), aspirin, carbon monoxide, cyanide, ethanol (in alcoholic ketoacidosis), ethylene glycol, ibuprofen (in severe cases), iron, isoniazid, metformin, and methanol can all cause acidosis [2,3]. Barbiturates, carbon monoxide, cyanide, opioids, and simple asphyxiants (e.g., methane) can cause hypoxemia [2,3]. Acetaminophen is one of the most commonly ingested drugs in cases of self-poisoning. The early signs and symptoms of acetaminophen poisoning are nonspecific and often mild in intensity. There may not be any signs or symptoms early in the course (or symptoms may be nonspecific), and the longer the time between toxic ingestion of acetaminophen and antidotal therapy, the less effective the treatment will be. An acetaminophen level should always be obtained in cases of self-poisoning. BUN and serum creatinine levels are used to evaluate renal function and detect renal damage. Acetaminophen poisoning can on occasion cause elevations in BUN and creatinine, as can a massive ingestion of ibuprofen. Ethylene glycol and methanol poisoning produce metabolites that are directly toxic to the kidney. A complete blood count (CBC) can detect hemolysis and other blood abnormalities. Benzocaine, dapsone, naphthalene mothballs, and nitrites can cause hemolysis. Benzocaine, dapsone, lidocaine, nitrites, phenazopyridine, and prilocaine can cause methemoglobinemia . Anticoagulant rodenticides (e.g., d-CON) and warfarin can cause abnormal coagulation studies . Measurement of blood glucose levels should be considered. Hypoglycemia can be caused by aspirin, sulfonylurea, and ethanol poisoning. Hyperglycemia can be caused by iron poisoning, beta blockers, and calcium channel blockers . Poisoning from many drugs and toxins can result in specific electrolyte imbalances. For example, an elevated anion gap can be caused by acetaminophen (in very serious cases), aspirin, carbon monoxide, cyanide, ethanol (in alcoholic ketoacidosis), ethylene glycol, iron, isoniazid, metformin, and methanol. Changes in specific electrolytes associated with poisoning are too numerous to discuss. As examples, MDMA (Ecstasy) can cause hyponatremia, digoxin and hydrofluoric acid can cause hyperkalemia, and hydrofluoric acid poisoning can cause hypocalcemia and hypomagnesemia . Ethanol (in alcoholic ketoacidosis), ethylene glycol, isopropyl alcohol, and methanol can increase serum osmolality and cause an elevated osmolar gap. Acetaminophen, Amanita phalloides mushroom, and valproic acid poisoning can cause liver damage and elevation of hepatic transaminases. Urinalysis can be useful in assessing imbalances. In cases of isopropyl alcohol poisoning, ketonuria may be seen. One of the metabolites of ethylene glycol, oxalic acid, forms a complex with calcium, and the calcium oxalate crystals may be seen in the urine of patients who have ingested this toxin. Both commonly prescribed and illicitly used drugs can cause ECG abnormalities [5,17]. Antiarrhythmic drugs, digoxin, diphenhydramine, phenothiazines, propoxyphene, and TCAs can cause prolonged QRS. Amiodarone, chlorpromazine, droperidol, erythromycin, haloperidol, methadone, sotalol, and thioridazine are drugs that can cause a prolonged QT and possibly torsades de pointes [18,19]. In addition, amphetamine, anticholinergic drugs, beta blockers, calcium channel blockers, cocaine, digoxin, and phenothiazines are associated with other conduction defects and arrhythmias. There are two common situations for which imaging studies should be used in the assessment of a poisoned patient: visualizing a potentially dangerous foreign object (e.g., a button battery, lead-containing paint chips), or visualizing intact illicit drugs or medications in the gastrointestinal tract. Button batteries, also known as disk batteries, are used in calculators, hearing aids, watches, and other electronic devices. These objects are small, easily swallowed, and clearly visible on a plain x-ray. A disc battery that is lodged in the esophagus and is not promptly removed can cause significant tissue damage and, rarely, death, and an x-ray should be done as soon as possible in these cases . The dangers of pediatric exposure to lead are well known, and unfortunately, ingestion of lead-containing paint chips is still a relatively common occurrence. Lead paint chips are radiopaque, and their presence in the gut confirms an ingestion and helps guide management. Imaging studies can also detect packets of illicit drugs that have been deliberately swallowed or inserted into body cavities (commonly called packing or stuffing). Intact drug packets are easily seen in with a plain x-ray, but the presence of small and loosely secured drug packets that were swallowed may not be clearly visible [21,22,23,24]. There is some evidence that low-dose computed tomography (CT) is the best technique to reliably detect swallowed drug packets . Some prescription and over-the counter medications are radiopaque and may appear on x-ray, including chloral hydrate, iron, phenothiazines, and enteric-coated and sustained-release preparations . However, the reliability of x-ray to detect these agents in the gut is not established. Imaging studies can also be useful in assessing for the presence of an ingestion of a simple hydrocarbon (e.g., gasoline, kerosene). Simple hydrocarbons are generally not dangerous, unless they are aspirated into the lungs. If aspiration occurs, pneumonitis is possible. After the ABCs have been evaluated and stabilized and the history and physical exam have been completed, the use of gastric decontamination should be considered. Gastric decontamination refers to techniques used to either prevent the absorption of a poison or actively remove it from the gastrointestinal tract; some techniques do both. Gastric decontamination is a standard (albeit infrequently used) treatment for poisoned patients. As with any therapeutic intervention, its proper use is situationally dependent and gastric decontamination should only be done if there is an indication for its use, there are no contraindications to its use, and after considering the benefits and risks. Gastric decontamination is an intuitive intervention. If an individual has ingested a drug or a poison, the first instinct is to make an effort to remove it or prevent it from being absorbed. The available methods of gastric decontamination essentially do this; gastric lavage will remove medications from the gut, and activated charcoal prevents the absorption of ingested drugs [5,25,26]. However, the effectiveness of gastric decontamination techniques has never been proven. It is clear that activated charcoal can adsorb ingested drugs and gastric lavage and whole bowel irrigation can remove ingested drugs, but it has not been shown that adsorbing or removing ingested drugs with gastric decontamination techniques improves clinical outcomes . The second issue is that there is no universal agreement on the clinical application of gastric decontamination—when it should be used, for whom, and using which technique(s) . Although there are convincing arguments against the use of gastric decontamination, there are guidelines for its use and research suggesting it can be helpful. Some toxicology experts still recommend that gastric decontamination be considered as a treatment for poisonings . There is very little unequivocal data about gastric decontamination. Consider the information in this module to be a guideline, with the decision to use gastric decontamination made on an individual basis, as with any other therapy. Activated charcoal is produced from carbonaceous substances such as peat or wood that have been pulverized and specially treated. This charcoal powder is added to a liquid (most often water and sorbitol) and delivered orally. Activated charcoal adsorbs (not absorbs) drugs or toxins in the gut, and it can also interrupt their enterohepatic and enteroenteric recirculation . Most drugs and toxins are well adsorbed by activated charcoal, but acids, alkalis, alcohols, iron, and lithium are not. The adsorption bond is very strong. The charcoal-drug complex is excreted in the stool, absorbed by macrophages, or dissociated slowly enough so the drug does not cause harm. Although it is clear that activated charcoal can adsorb toxins and drugs, it is unknown if this action improves clinical outcomes [25,26,27,28,29]. However, the capacity of activated charcoal to significantly decrease drug absorption, the simplicity of the technique, and its relative lack of adverse effects have resulted in activated charcoal still being recommended for the treatment of poisoned patients. Activated charcoal should be given if the drug/toxin is susceptible, if a toxic dose of a drug/toxin was ingested, and if the ingestion occurred within one hour of arrival. This timeframe should not be considered inviolable, and if there are no contraindications and a substantial amount of drug/toxin may still be in the gut, late administration of activated charcoal may be done. The most common adverse effect of activated charcoal is vomiting. Vomiting is a risk factor for aspiration, and patients who vomit after being given activated charcoal may develop adult respiratory distress syndrome (ARDS) and pneumonitis [25,30]. Fortunately, serious respiratory complications caused by activated charcoal are uncommon, and aspiration of gastric contents and charcoal may be no worse than aspiration of gastric contents alone [25,26,31]. Other possible adverse effects of activated charcoal are abdominal pain, constipation, diarrhea, and nausea . The prescribed dose of activated charcoal is usually a 10:1 ratio of activated charcoal to drug, but other dosing recommendations have been published (e.g., 25–100 g of activated charcoal for an adult, 0.5–2.0 g/kg for a child) and the optimal dose is not known [25,26,29]. Dosing activated charcoal will always be an uncertain process, given that it is unusual to know exactly how much of a drug was ingested, how much drug is still in the gut, and how the adsorptive ability of activated charcoal will be affected by food and co-ingestants. In general, 50–100 g of activated charcoal is likely more than enough for most poisoned patients, and the risk of vomiting may increase as the amount of activated charcoal is increased . Activated charcoal has a gritty texture and an unappetizing appearance, so it is not unusual for patients to refuse to drink it. The powder can be mixed with anything tasteful that masks its appearance (e.g., chocolate syrup, ice cream, juice). This will decrease its adsorptive strength, but this effect is not considered clinically important. Multi-dose activated charcoal involves administering sequential doses several hours apart. This approach is thought to reduce the absorption of extended-release medications, interrupt enterohepatic recirculation, and interrupt enteroenteric recirculation [25,26]. Multiple-dose activated charcoal can increase the elimination of carbamazepine, dapsone, phenobarbital, quinine, or theophylline. However, there is no proof that it offers clinical benefits, and the research on multiple-dose activated charcoal is limited and of relatively low quality. If used, multiple-dose activated charcoal may be given if the patient has taken a toxic amount of a susceptible drug or an extended-release medication. Other indications for, contraindications against, and adverse effects of multiple-dose activated charcoal are the same as for the single-dose regimen. The rate of adverse effects is reportedly low and equivalent to the rate associated with single-dose activated charcoal. One approach is an initial dose of 1 g/kg or a 10:1 charcoal-to-drug ratio, whichever is greater. The initial dose is followed by 0.5 g/kg every 4 to 6 hours for 12 to 24 hours. The therapy should be stopped when the patient's clinical condition and/or drug levels (if available) improve. It is important not to give multiple doses of activated charcoal that contains sorbitol . Other dosing regimens that are more and less aggressive have also been published . In the past, cathartics were used to increase gastrointestinal transit time and decrease the absorption of ingested drugs. The osmotic cathartics magnesium citrate and sorbitol were once commonly used to treat poisoned patients; however, cathartics, either alone or used with activated charcoal, are no longer generally recommended as a treatment for the poisoned patient [25,32]. Some brands of activated charcoal are pre-mixed with a sorbitol cathartic, and a one-time dose can be given safely. Excessive use of cathartics can cause abdominal cramping, electrolyte imbalances, and fluid loss. Gastric lavage involves the insertion of an orogastric tube into the stomach to manually suction out the contents. It is the most intuitively logical gastrointestinal decontamination technique, but it is considered a therapy with very limited (if any) benefits [25,26]. There is no conclusive evidence that it improves clinical outcomes. The amount of drug that is removed varies considerably, and gastric lavage may push drugs that are in the stomach past the pylorus and into the small intestine. Activated charcoal is less invasive and probably more effective. There is, or is likely to be, unabsorbed drug in the stomach. The ingested medication has the potential to cause serious harm. There are life-threatening signs and symptoms. The drug or toxin is not adsorbed to activated charcoal. The amount of drug ingested makes administering a sufficient dose of activated charcoal impractical. There is no antidote for the drug and no alternative therapy that can treat toxicity caused by the drug. Gastric lavage is contraindicated if the criteria for use are not met; spontaneous emesis has occurred; it has been more than one hour since the ingestion occurred; the patient ingested an acid or alkali; the patient has a bleeding disorder; or if the patient is a body packer or stuffer. Possible adverse effects of gastric lavage include (but are not limited to) aspiration, bleeding, hypoxia, and injury to the airway, esophagus, or stomach. If done, gastric lavage should be administered with the patient in the left lateral decubitus position with his or her head and neck supported. This position may help prevent ingested drug from being pushed through the pylorus. A 36–40F orogastric tube is used for adults; for children, a 22–28F tube is recommended. After the tube is confirmed to be in the stomach, suction is initiated. After this, activated charcoal can be instilled if the patient has ingested a large amount of drug. Then, 250 mL of saline lavage solution is instilled. (For pediatric patients, use 10–15 mL/kg, to a maximum of 250 mL.) The instilled solution is then aspirated and the process repeated several liters have been given (0.5–1.0 liter for children) or until the aspirate is clear. If indicated, one may finish with a dose of activated charcoal. Syrup of ipecac is an over-the-counter preparation that contains several alkaloids that act centrally and locally to induce vomiting. There is no doubt that syrup of ipecac consistently induces emesis; however, the amount of drug removed by ipecac-induced emesis is variable and unpredictable. There is no evidence of its clinical benefit for poisoned patients, and its use can interfere with other, more effective gastrointestinal decontamination techniques. Syrup of ipecac is associated with potential adverse effects (e.g., drowsiness, occasionally prolonged vomiting) that are hazardous for the patient. Situations in which syrup of ipecac may be an appropriate treatment are rare, and this approach is not recommended by the American Academy of Toxicology, the European Association of Poisons Centres and Clinical Toxicologists, or the American Academy of Pediatrics [33,34,35]. Whole bowel irrigation is performed by instilling a non-absorbable, osmotically balanced polyethylene glycol (PEG) solution into the patient's gut orally or through a nasogastric tube. For infants and children 9 months to 5 years of age, the goal rate is 500 mL per hour; for children 6 to 12 years of age, the rate is 1,000 mL per hour. For adults and children 13 years of age and older, the goal rate is 1,500–2,000 mL per hour. The flow and volume of the PEG solution acts as a continuous irrigation and mechanically removes ingested drugs/toxins. As with all gastrointestinal decontamination techniques, there is a logical basis for the use of whole bowel irrigation, but there has been little research on it and no conclusive evidence for its effectiveness [25,26,36]. Despite these limitations, whole bowel irrigation may be prescribed. Indications for whole bowel irrigation include ingestion of drug packets, a foreign body, or a toxic amount of an enteric-coated medication, an extended-release medication, or iron, lithium, or potassium. Contraindications are bowel obstruction, ileus, or any condition that affects normal bowel functioning; a clinically significant gastrointestinal hemorrhage; continued vomiting; inability of the patient to protect his/her airway; and hemodynamic instability. Possible adverse effects of whole bowel irrigation are those that would be expected from instillation of large volumes of liquid into the gut: bloating, cramping, diarrhea, nausea, and vomiting. Whole bowel irrigation is unpleasant for the patient, and it is a time-consuming procedure for the staff. Hemodialysis is a very useful and highly effective technique for treating aspirin poisoning, lithium poisoning, and toxic alcohol poisoning. It removes aspirin, ethylene glycol, and methanol (and the toxic metabolites) and corrects the acid-base disturbances that are common to these exposures. Activated charcoal and lavage will not be helpful in treating lithium poisoning, but whole bowel irrigation has a limited role. Although fluid replacement helps lithium excretion, it may not be helpful for severely ill patients. Most poisoned patients can be managed with supportive care. However, in some cases antidotal therapy is needed because the toxic effects of a drug or poison can only be interrupted or reversed by an antidote. In addition, some antidotes bind the drug after it has been absorbed. When use of an antidote is being incorporated in the management plan, the indications, contraindications, dose, risks, and benefits should be assessed. If a patient has taken an overdose but does not have signs or symptoms, consider what the patient has taken, how much, the effectiveness of supportive care, and other factors before using an antidote. There are no universally accepted, standard guidelines for most antidotes. Given the unknowns of most intentional overdoses and the relative lack of data about poisonings and antidotes, this is expected. The approach used with prescription medications to determine dosing, indications, contraindications, and adverse effects—extensive clinical testing under tightly controlled conditions—is impractical and unethical in cases of poisonings. The antidote recommendations provided in this course come from authoritative sources and a thorough review of the latest medical literature. Professionals who are unsure of how to use an antidote, are urged to contact their local poison control center for a toxicology consultation. Bites from pit vipers, such as rattlesnakes, can cause significant tissue damage and serious systemic effects, with the exception of copperhead snake envenomations, which are generally mild and do not typically require antidotal treatment. Envenomation from poisonous spiders can on occasion cause serious systemic effects, but these situations are relatively rare. Antivenom is seldom needed for spider bites, and this situation will not be discussed in this course. Crotalidae polyvalent immune FAB (CroFab) antivenom has replaced crotalinae polyvalent antivenom as the antidote for pit viper envenomation . The older antivenom was derived from horse serum and the risk of anaphylactic reaction was much higher than the risk associated with CroFab, which is derived from sheep serum. Antivenom binds to the snake venom and inactivates it. Prompt use of antivenom can prevent tissue damage and systemic effects when supportive care alone cannot. Antivenom should be given to patients who have significant signs and symptoms of envenomation by a pit viper, including pain, swelling, coagulopathies, hypotension, and neurologic signs/symptoms (e.g., fasciculations, paresthesias). CroFab is contraindicated in persons with sensitivity to sheep or sheep products or to papayas or papain. Anaphylaxis is a potential adverse effect, and drugs and equipment to treat anaphylaxis should be immediately available. Crofab is administered via IV, and the initial dose is usually 4 to 6 vials (range: 4 to 12 vials) . Each vial should be reconstituted with 18 mL of 0.9% sodium chloride. Gently rotate/swirl the vials; do not shake. The reconstituted CroFab should be instilled into an IV bag of 0.9% sodium chloride to a total volume of 250 mL. The infusion should be started at 20–50 mL per hour for the first 10 minutes . If the patient has no signs or symptoms of anaphylaxis, increase the rate so the full dose is delivered within one hour. One hour after the infusion is complete, assess the patient for a clinical response. If there is no response or the response is unsatisfactory, give four to six vials and repeat as needed. When a good response has been achieved, give two vials every six hours for three doses . Atropine is a competitive antagonist of acetylcholine at parasympathetic and sympathetic synapses and at the neuromuscular junction. Atropine is used as an antidotal therapy to treat cases of organophosphate or carbamate insecticide poisoning . Exposure to these chemicals die can cause potentially dangerous bronchorrhea and bronchoconstriction; atropine can be very effective in reversing these effects. Atropine also increases heart rate and cardiac conduction, and as such, it can be used to treat symptomatic, drug-induced bradycardia caused by beta blockers, calcium channel blockers, clonidine, and digoxin. Atropine is indicated for patients with symptomatic organophosphate or carbamate insecticide poisoning or drug-induced bradycardia [39,40]. However, it is typically considered a second-line therapy for these clinical situations, and it is unlikely to have a lasting effect [41,42]. Atropine is contraindicated for patients who cannot tolerate tachycardia or with angle-closure glaucoma, bowel obstruction, myasthenia gravis, or urinary tract obstruction. Potential adverse effects of atropine include blurred vision, dry mouth, palpitations, tachycardia, and urinary retention. Agitation and delirium can occur if large doses are used. For organophosphate/carbamate poisoning, the initial adult dose is 2–5 mg IV; the initial pediatric dose is 0.05 mg/kg IV . Subsequent doses should be based on the patient's clinical and pulmonary status. In severe cases, a continuous infusion may be administered for several days, and a seriously poisoned patient may require hundreds of milligrams of atropine . As treatment for symptomatic drug-induced bradycardia, the dose of atropine is 0.5 mg IV, given rapidly. This dose is repeated every three to five minutes up to 3 mg. Doses less than 0.5 mg and slow administration may cause a paradoxical bradycardia. Calcium channel blockers (e.g., amlodipine, diltiazem, verapamil) inhibit the movement of calcium through voltage-gated calcium channels, while high doses of calcium increase calcium flow across cell membranes and increase the release of calcium from intracellular stores. Patients who have been poisoned with a calcium channel blocker are unlikely to respond to atropine and the commonly used vasopressors. Intravenous boluses of calcium chloride or calcium gluconate are first-line treatments for calcium channel blocker overdose, but this is often ineffective or the improvements in cardiovascular status are short-lived [42,43,44]. Nonetheless, calcium salts are often given in these clinical situations. Calcium replacement is also indicated for symptomatic cases of beta-blocker poisoning and symptomatic cases of hydrofluoric acid burns and poisoning . Hydrofluoric acid is used in the home as a rust remover and aluminum cleaner, and it has many industrial uses as well. Hydrofluoric acid poisoning causes pain, burns, and possibly profound hypocalcemia. The dose for treating a beta blocker or calcium channel blocker overdose is 1 gram of calcium chloride or calcium gluconate given IV over 10 minutes. The dose can be repeated every 20 minutes up to four doses. If a continuous infusion is given, the dose is 0.02–0.04 g/kg per hour. It is important to closely monitor serum calcium levels and heart rate and rhythm during calcium therapy. If calcium chloride is used, infusing through a central venous catheter may minimize irritating side effects. Depending on the route and the severity of a hydrofluoric acid exposure, calcium may be given topically, as an intradermal injection, intra-arterially, IV, as an ocular wash, or as a nebulized solution. Dosing recommendations for these applications are complex and beyond the scope of this course. Calcium therapy is contraindicated in cases of known or suspected digoxin toxicity. Potential adverse effects include local tissue irritation, hypercalcemia, bradycardia, dysrhythmias, hypotension, syncope, and neuromuscular weakness. Iron toxicity can cause CNS depression, hypotension, metabolic acidosis, and shock. Deferoxamine is the antidote for significant iron poisoning; it binds to the ferric form of iron, forming a water-soluble compound that is excreted in the urine, which will often cause the urine to turn pink or light red. Deferoxamine is indicated if the serum iron level is greater than 500 mcg/L or if a patient with iron poisoning has severe symptoms (e.g., CNS depression or coma, hypotension, prolonged diarrhea and/or vomiting, shock) or anion gap metabolic acidosis. It may also be used for patients with many undissolved iron tablets in the gut . Deferoxamine should be used cautiously in patients who are anuric and/or who have severe renal disease. The most significant possible adverse effects of deferoxamine are ARDS and hypotension. ARDS has been reported after deferoxamine infusions of 32 to 72 hours . Acute lung injury and Yersinia enterocolitica sepsis are possible complications if therapy continues for more than 24 hours. Deferoxamine is given as an IV infusion, and the standard dose is 15 mg/kg per hour, but higher doses can be used, if needed, up to a maximum 6 grams per day. Most patients require the drug for about 24 hours, but there are no agreed-upon endpoint criteria. If a patient requires deferoxamine therapy for more than 24 hours, use the lowest dose possible. The myocardium normally uses free fatty acids for energy, but when the myocardium is stressed, as with calcium channel blocker poisoning, it switches to glucose metabolism for fuel. However, calcium channel blocker toxicity also impairs insulin release and glucose uptake. The resultant lack of energy compounds the toxic effects of calcium channel blockers on the myocardium. Dextrose and insulin give the poisoned myocardium a source of energy and the means to use it. In addition, insulin has a positive inotropic effect [41,42,49]. Although dextrose and insulin are primarily used for calcium channel blocker poisoning, there is also evidence that this therapy may be helpful for treating beta blocker poisoning. Dextrose-insulin therapy appears to be effective for correcting hypotension and less effective for correcting bradycardia and conduction defects. Give the patient a 1 unit/kg bolus dose of regular insulin. Measure serum glucose and serum potassium. If the serum glucose is <200 mg/dL, give the patient a bolus dose of 50 mL of 50% dextrose. If the serum potassium is <2.5 mEq/L, give IV potassium supplementation. Follow the insulin bolus with a continuous infusion of regular insulin, diluted in 0.9% normal saline. Start the infusion at 0.5 units/kg per hour. A response in blood pressure (not heart rate) and peripheral perfusion should be seen within 15 to 30 minutes. If there is no improvement, increase the infusion rate; doses of ≥10 units/kg per hour have been used. Monitor serum glucose and potassium very closely (i.e., every 15 to 30 minutes) during the first few hours of treatment. Most patients will require a continuous infusion of dextrose, often 10% or 20% dextrose, to maintain serum glucose is >100 mg/dL. Maintain serum potassium between 3.0–4.5 mEq/L. Periodically measure serum magnesium and phosphorus. Insulin blood levels will remain high after the infusion has been stopped, so serum glucose should be carefully monitored for 24 hours after therapy has been discontinued. There are no contraindications for high-dose insulin/glucose use. Common adverse effects include hypoglycemia and hypokalemia, but these can be managed and have not been reported to cause serious harm. Hypophosphatemia and hypomagnesemia are possible, and vein irritation from the dextrose infusion is common [49,50,51]. Digoxin-specific antibodies, also called Fab fragments, irreversibly bind to free digoxin to resolve symptoms of digoxin toxicity. The Fab-digoxin complex is then renally excreted. As the Fab-drug complex is excreted, an imbalance in the concentrations of digoxin between the tissues and the serum develops. As a result, more digoxin travels from the tissues into the serum and is bound to the Fab fragments and excreted. The effectiveness of digoxin-specific antibodies has been reported to be 50% to 90% . Fab fragments are recommended to treat patients with digoxin poisoning who have life-threatening arrhythmias or cardiac arrest, acute ingestions causing serum digoxin levels ≥10 ng/mL at six hours or more after ingestion (or chronic ingestions causing steady-state serum digoxin concentrations exceeding 6 ng/mL in adults or 4 ng/mL in children), serum potassium levels ≥5.0 mEq/L, or have ingested ≥10 mg . It is important to note that abnormally high serum potassium is a better predictor of potentially serious harm from digoxin poisoning than the serum digoxin level or ECG changes. It should be noted that there is no universal agreement on these indications, and Fab fragment guidelines differ slightly. There are no contraindications to the use of Fab fragments, but if a patient is allergic to sheep or papaya/papain, the risks versus benefits should be carefully considered. Patients with atrial fibrillation or heart failure may experience an exacerbation. Hypokalemia is possible. Fab fragments are dosed according to the number of vials. There are two methods for dosing: by the serum digoxin level or by the amount of digoxin ingested (Table 2). If the amount ingested is not known and a serum digoxin level cannot be quickly obtained, 10 to 20 vials can be given empirically . Fab fragments can be given as an IV bolus, but they are usually administered IV over 30 minutes. The response to Fab fragments should be seen within 30 minutes. Example: 6.02 ng/mL x 75 kg = 451.5, divided by 100 = 4.515. For this patient, 4.5 vials should be used. Example: 6 mg divided by 0.5 = 12. For this patient, 12 vials should be used. Cyanide disrupts mitochondrial production of adenosine triphosphate (ATP) and causes body-wide cellular asphyxia, often causing cardiac arrest and death. Hydroxocobalamin is the preferred antidote for cyanide poisoning [52,53]. Hydroxocobalamin competitively binds to cyanide and forms cyanocobalamin (vitamin B12), which is then excreted in the urine. The dose is 5 grams IV diluted with 0.9% sodium chloride and infused over 15 minutes. A second 5-gram dose can be administered, if needed, as an infusion over 15 minutes to 2 hours. More severe symptoms call for a faster infusion rate. Pediatric dosing is not in the prescribing information, but some recommend 70 mg/kg (maximum: 5 grams). Renal function should be monitored for seven days after administration of hydroxocobalamin. There are no contraindications to its use. Adverse effects include acute renal failure, erythema, headache, increased blood pressure, injection reactions, and transient chromaturia. Flumazenil is a benzodiazepine antagonist that prevents benzodiazepines from binding to receptors. It will reverse the CNS and respiratory depression caused by these drugs, avoiding the need for endotracheal intubation. The indications for flumazenil are accidental, symptomatic pediatric ingestion of a benzodiazepine; oversedation caused by therapeutic use; and reversal of paradoxical reactions to a benzodiazepine . Flumazenil should not be routinely used for known or suspected benzodiazepine overdoses, as these overdoses are rarely fatal and can be successfully treated with symptomatic/supportive care. In addition, flumazenil should not be used as a routine treatment for an overdose patient when the ingested drug has not been identified. Flumazenil is given in gradually increasing doses until the patient responds, starting with a dose of 0.2 mg IV . If there is no response, increase to 0.3 mg; in the presence of continued non-response, doses of 0.5 mg may be given every 30 seconds up to a maximum of 3 mg.
Flumazenil is contraindicated if a patient has a seizure disorder, if he/she has ingested a medication that is likely to cause seizures, or if the patient is habituated to benzodiazepines. In the latter situation, administering flumazenil can precipitate benzodiazepine withdrawal. Potential adverse effects include anxiety, headache, nausea, and vomiting. Ethylene glycol and methanol are commonly called the toxic alcohols. These alcohols are metabolized by alcohol dehydrogenase to acids and other compounds that can cause profound acidosis, coma, permanent ocular damage, and renal failure. Fomepizole blocks the metabolism of ethylene glycol and methanol by inhibiting the activity of alcohol dehydrogenase . Fomepizole is much easier and less risky to use than hemodialysis or the traditional antidote for toxic alcohol poisoning, ethanol. Thus, it is indicated in cases of confirmed or suspected ethylene glycol or methanol poisoning. Indications for the use of fomepizole include serum ethylene glycol level >20 mg/dL; a documented history of ingestion of a toxic amount of ethylene glycol or methanol; or a known or suspected ingestion of ethylene glycol or methanol and a serum pH <7.3, an osmolal gap >10 mOsm/L, a serum bicarbonate level <20 mEq/L, or oxalate crystals in the urine. It is administered in a loading dose of 15 mg/kg (maximum: 1 g). The drug is diluted in 100 mL of normal saline or 5% dextrose and infused slowly over 30 minutes . The loading dose is followed by four doses of 10 mg/kg, each dose separated by 12 hours. After the fourth dose, the patient should receive doses of 15 mg/kg every 12 hours until the ethylene glycol or methanol level is <20 mg/dL. There are no contraindications to the use of fomepizole. Adverse effects are usually mild and include dizziness, headache, nausea, and irritation at the infusion site. Beta blocker poisoning causes bradycardia, cardiac conduction delays, and hypotension. Treatment with sympathomimetics and/or vasopressors (e.g., epinephrine, norepinephrine) may not be effective because these drugs work by stimulating adrenergic receptors. In these cases, glucagon is the treatment of choice. Glucagon binds to specific cell membrane receptors, bypasses the adrenergic receptors, and increases the intracellular concentration of cyclic adenosine monophosphate (cAMP). cAMP is a second messenger, and it activates intracellular enzymes that affect myocardial activity. In cases of beta blocker poisoning, glucagon increases heart rate, improves cardiac conduction, and increases contractile force. It has also been used as a second-line option for treating calcium channel blocker poisoning [41,44]. The dose of glucagon is 5 mg for adults or 50 mcg/kg for children, delivered as a bolus over one minute. If blood pressure and pulse do not improve one to three minutes after the bolus, a second dose is given; if two doses do not provide a response, it is unlikely further doses will. If blood pressure and pulse do improve, a continuous infusion of 2–5 mg per hour is started (70 mcg/kg per hour for children). There are no criteria for an endpoint for glucagon therapy. The presence of insulinoma or pheochromocytoma is a contraindication to glucagon use. Hyperglycemia, hypokalemia, nausea, and vomiting are common adverse effects. Levocarnitine (L-carnitine) is a naturally occurring amino acid derivative that is used by the mitochondria for fatty acid metabolism. Valproic acid poisoning prevents the synthesis of levocarnitine. This in turn disrupts fatty acid metabolism, and acute valproic acid poisoning is often characterized by hyperammonemic CNS depression, coma, and hepatic damage. Exogenous levocarnitine decreases serum ammonia levels and may be effective at improving the clinical course of acute valproic acid poisoning [56,57]. Levocarnitine should be considered in the treatment of acute valproic acid overdose if there is severe hepatotoxicity, coma, a serum valproic acid level >450 mcg/mL, or hyperammonemic encephalopathy. The initial dose of levocarnitine is 100 mg/kg IV (maximum: 6 g) given over 30 minutes. This is followed by 50 mg/kg IV (maximum: 3 g) given every eight hours. The endpoint of therapy has not been well-defined, but should be based on the patient's neurologic status, serum ammonia level, and serum valproic acid level. There are no known contraindications to the use of levocarnitine. Adverse effects are primarily gastrointestinal (e.g., diarrhea, nausea, vomiting). Intravenous lipid emulsion involves the use of an emulsion of egg phospholipids and soybean oil as an accepted antidote for treating toxicity caused by local anesthetics . Its use in the treatment of symptomatic overdoses of antiepileptics, cardiovascular medications (e.g., beta blockers, calcium channel blockers), and antidepressants (e.g., bupropion, tricyclic antidepressants) has produced mixed results . The antidotal/therapeutic mechanism of action is not known, but animal studies suggest that lipid emulsion forms a tight bond with certain lipid-soluble drugs, preventing them from reaching tissues and receptor sites, or that the lipid emulsion may actively remove drugs that have already reached these areas . Lipid emulsion is considered a second-line therapy for treating symptomatic overdose of drugs and toxins. The initial bolus dose for IV lipid emulsion is 20% solution, 1.5 mL/kg, infused in over five minutes. Following the bolus dose, a continuous infusion of 20% solution 0.25 mL/kg should be given over 30 to 60 minutes . The dose can be repeated several times, or the infusion rate can be increased, if needed. Intravenous lipid emulsion has been used for children, but there is no specific pediatric dosing. There are no specific contraindications for the use of IV lipid emulsion. Adverse effects include (but are not limited to) acute kidney injury, acute lung injury, cardiac arrest, interference with laboratory tests, pancreatitis, and recurrent or delayed toxic effects from the ingested drug [59,60]. Excessive oxidative stress can change hemoglobin to methemoglobin, a form of hemoglobin that cannot carry oxygen. Chemicals such as nitrates and some drugs—particularly dapsone, local anesthetics like benzocaine, and phenazopyridine—can cause the formation of methemoglobin and overwhelm the body's normal methemoglobin reducing mechanisms. Methemoglobinemia produces very distressing signs and symptoms, and for some patients, the hypoxemia can be dangerous. Waiting for methemoglobinemia to spontaneously resolve is not reasonable or safe. Methylene blue increases the activity of the nicotinamide adenine dinucleotide phosphate-reducing system (normally a minor pathway) and changes methemoglobin back to hemoglobin . Methylene blue should be used for patients who have a methemoglobin level greater than 30% or who have a higher than normal methemoglobin level and signs and symptoms of hypoxemia . However, methylene blue should be avoided in the presence of severe renal failure, glucose-6-phosphate dehydrogenase (G6PD) deficiency, or methemoglobin reductase deficiency. It should not be used to reverse methemoglobinemia that was induced during treatment for cyanide poisoning. The recommended dose is 1–2 mg/kg IV of a 1% solution given over five minutes; this dose may be repeated after 60 minutes. The IV line should be flushed with normal saline, as methylene blue irritates the veins. Methylene blue produces maximal effects within 30 minutes of administration, with a rapid reduction in methemoglobin and improvement in signs of methemoglobinemia. Nonresponse after two doses could be a sign that the patient has G6PD deficiency or methemoglobin reductase deficiency, the doses have been too low, or the drug is still present in the gut. Dizziness, headache, and nausea may develop. High doses (greater than 7 mg/kg) may cause methemoglobinemia or hemolysis . When a toxic dose of acetaminophen greater than 7.5 grams or 150 mg/kg is ingested, the normal metabolic pathways for the drug are overwhelmed and a large amount of a toxic metabolite is produced. This metabolite binds to the liver and can cause significant hepatic damage; acetaminophen poisoning (intentional and unintentional) is a leading cause of acute liver injury and failure and the need for liver transplant. By several complex mechanisms, N-acetylcysteine (NAC) counteracts the effects of acetaminophen poisoning. NAC is indicated for patients who are known to or suspected to have acutely ingested a toxic amount of acetaminophen and who have a serum acetaminophen level that is at or above the probable toxicity line on the Rumack-Matthew nomogram (Figure 1). It may also be used for patients who have a chronic ingestion of toxic doses of acetaminophen and evidence of liver damage. NAC can be given IV or orally. The two forms are equally effective, but the oral formulation requires three days of treatment (compared to 21 hours for the IV formulation) and is more difficult for the patient to tolerate and the staff to manage. The dose for the oral preparation is 140 mg/kg, followed in four hours by 70 mg/kg given every four hours to a total of 17 doses. Oral NAC is available as a liquid or an effervescent tablet. The current, FDA-approved IV protocol involves an initial dose of 100 mg/kg IV, infused over 60 minutes, followed by 50 mg/kg IV infused in over four hours. Finally, 100 mg/kg IV is infused over 16 hours. These infusions should be given consecutively, with no gap . Several hours before the third infusion will be completed, a serum acetaminophen level, liver function, and international normalized ratio (INR) should be assessed. If there is measurable serum acetaminophen or if the liver function tests and/or INR are abnormally elevated, NAC therapy should be continued. In situations of a massive acetaminophen overdose, the IV NAC protocol may be altered, with higher doses of NAC administered . In addition, research has shown that a two-infusion protocol—200 mg/kg over four hours followed by 100 mg/kg over 16 hours—may decrease the number of hypersensitivity reactions . There are no contraindications to the use of NAC. However, the oral form cannot be used if the patient has a malfunctioning gut, and the IV form should be used cautiously if the patient has asthma or bronchospasm. The most common adverse effect of IV NAC is a hypersensitivity reaction; these usually happen in the first hour of treatment. Most of the hypersensitivity reactions are mild, self-limited, and easily treated; anaphylaxis occurs very infrequently. The coagulation tests may be falsely elevated by NAC. Nausea and vomiting are common adverse effects of the oral formulation. Opioids bind to specific mu and kappa receptors in the brain and spinal cord. When these receptors are stimulated, CNS activity in certain parts of the brain is decreased and the clinical effects of opioids (e.g., analgesia, respiratory depression, sedation) are produced. Naloxone is a competitive opioid antagonist that displaces and prevents binding of opioids to receptors. As such, it can reverse respiratory depression and help avoid endotracheal intubation and prolonged hospital stays. According to the Department of Veterans Affairs, providers should consider dispensing intranasal naloxone for patients with history of opioid overdose and those who are at high risk. Naloxone is used to reverse respiratory depression caused by opioid poisoning. Although naloxone will reverse sedation, this should not be the primary goal of its use. There is some evidence that naloxone will reverse CNS and respiratory depression caused by clonidine, ethanol, guanfacine, and valproic acid poisoning and the toxic effects of other drugs, but the evidence for this is anecdotal and inconsistent . The adult dose of naloxone is 0.4–2 mg given IV, intramuscular, or subcutaneously. The intranasal dose is 4 mg in each nostril. Naloxone can also be given intra-lingually, intra-osseously, via an endotracheal tube, or as nebulized solution. The pediatric dose (for children older than 5 years of age) is 0.1 mg/kg (maximum: 2 mg). For both children and adults, repeat doses of naloxone can be given until the desired effect has been attained. However, if there is no response after 5–10 mg, it is unlikely the patient has opioid poisoning. Reversing the effects of some opioids (e.g., buprenorphine) may require higher-than-normal doses of naloxone. Because the half-life of some opioids is long and the effects of naloxone diminish and are gone in one to two hours, some patients with opioid poisoning will require a continuous IV infusion. In these cases, give the patient two-thirds of the dose that was successful in reversing respiratory depression every hour, or 0.4–0.8 mg/hour. In addition, patients who are opioid-poisoned and have been given naloxone should be observed for reoccurrence of respiratory and CNS depression; in some cases, six hours of observation after a dose of naloxone is required. There are essentially no contraindications for the use of naloxone. However, it should be used cautiously in patients who are opioid-dependent, as in some clinical situations, precipitation of opioid withdrawal can result in arrhythmias and pulmonary edema. Naloxone should not be used to treat infants who have been exposed to opioids in utero. Octreotide is a synthetic analog of somatostatin, a naturally occurring hormone that helps regulate the endocrine system. It decreases the release of insulin by the pancreas. Patients with sulfonylurea poisoning often have profound hypoglycemia that lasts for days and is not easily treated with IV dextrose or food, and octreotide has been successfully used for adults and children as an antidotal therapy for these cases . To reverse sulfonylurea poisoning, the adult dose is 50–100 mcg administered subcutaneously every 6 to 12 hours; the pediatric dose is 1–2 mcg/kg every 6 to 12 hours. The IV dosing for adults is a 50-mcg bolus, followed by a continuous infusion of 25 mcg/hour; the pediatric dose is 1 mcg/kg/hour. In either case, octreotide should be administered for at least 12 hours. After therapy is stopped, serum glucose should be monitored for 24 hours, as hypoglycemia can recur. There are no contraindications to the use of octreotide. Potential adverse effects are generally minor and include (but are not limited to) abdominal pain, bradycardia, chest pain, diarrhea, flatulence, hyperglycemia, hypertension, injection site pain, and nausea. Physostigmine is a reversible inhibitor of acetylcholinesterase, increasing the activity and concentration of acetylcholine at cholinergic synapses. It has been used to identify and/or treat patients who have severe anticholinergic poisoning that cannot be managed with supportive care . Anticholinergic poisoning can be caused by atropine, antihistamines, antipsychotics, TCAs, and some plants and mushrooms. Physostigmine should never be used to treat the anticholinergic effects of TCAs, and it should never be used concurrently with depolarizing neuromuscular blockers such as succinylcholine. Because physostigmine increases acetylcholine concentration at synapses, it should be used cautiously or avoided if the patient has a bladder or intestinal obstruction, asthma, diabetes, gangrene, Parkinson disease, cardiac conduction defects, peripheral vascular disease, or reactive airway disease. Prior to administering physostigmine, a 12-lead ECG and cardiac monitoring should be done to assess for cardiac conduction defects. To initiate treatment, administer 0.5–2 mg IV slowly at a rate of ≤1 mg/minute. (The pediatric dose is 0.02 mg/kg at a rate of ≤0.5 mg/kg.) The dose can be repeated as needed every 10 to 30 minutes, up to a maximum 4 mg for adults and 2 mg for children. Adverse effects of physostigmine include (but are not limited to) asystole, bradycardia, heart block, bronchospasm, gastrointestinal effects (e.g., nausea, vomiting), and seizures . Organophosphate and carbamate insecticides bond to acetylcholinesterase. If the bonding is not interrupted, it becomes irreversible and the enzyme is permanently damaged . This results in excess cholinergic stimulation. Pralidoxime, also known as 2-PAM, can break this bond, and when it is used with atropine, the two are synergistic . 2-PAM is approved for the treatment of symptomatic organophosphate or carbamate insecticide poisoning. It may also be used for persons exposed to certain chemical warfare agents, such as sarin and tabun, which are essentially organophosphates. Pralidoxime must be given with atropine, as 2-PAM alone is not effective to treat the neuromuscular signs and symptoms of organophosphate poisoning. The adult dose is 1–2 g, diluted in 100 mL of 0.9% normal saline and infused in over 15 to 30 minutes. The pediatric dose is 25–50 mg/kg (maximum: 1 g). After the bolus dose, most patients will require a continuous IV infusion, but repeat bolus dosing can be used as well. For an adult, the continuous infusion should be 8 mg/kg per hour; the pediatric dose is 10–20 mg/kg per hour. It is important to give 2-PAM as soon as possible. The longer the period of time from exposure to treatment with 2-PAM, the less likely it is the drug will break the bond between acetylcholinesterase and the insecticide. There are no contraindications for 2-PAM, but the drug should be used cautiously in patients with myasthenia gravis. Diplopia, dizziness, drowsiness, headache, and nausea may occur. If 2-PAM is given too rapidly, laryngospasm and serious cardiac and neurologic effects are possible . An overdose of the anti-tubercular drug isoniazid interferes with pyridoxine (vitamin B6) availability in the brain. Pyridoxine is essential in the production of GABA, a major inhibitory neurotransmitter. Patients who have taken an overdose of isoniazid are at risk for seizures due to the decrease in GABA production. These seizures often do not respond to conventional therapy but can be ameliorated with pyridoxine supplementation . The chemical monomethyl hydrazine has similar effects to those seen with isoniazid, and pyridoxine is used for patients with toxic exposures to this substance . Also referred to as MMH, monomethyl hydrazine is found in some mushrooms, most notably false morels, and is part of the formulation for some types of rocket propellants. Because MMH is believed to have the same action as isoniazid, treatment is similar for both types of poisonings . One gram of pyridoxine should be given for every gram of isoniazid or MMH ingested; the dose should be diluted in either 5% or 0.9% normal saline and infused at a rate of 1 g per minute. If the isoniazid dose ingested is not known, give 5 g and repeat this dose every 5 to 10 minutes as needed. (The pediatric dose is 70 mg/kg up to a 5 g maximum.) Seizures caused by isoniazid overdose will usually stop within minutes of giving pyridoxine, but if seizures continue, benzodiazepines should be added to the treatment regimen. Massive doses of pyridoxine cause sensory neuropathy, but when used for isoniazid poisoning, pyridoxine does do not produce adverse effects. Using sodium bicarbonate as an antidote is referred to as alkalinization, and sodium bicarbonate has three primary uses in toxicology: treatment of aspirin poisoning, symptomatic TCA poisoning, and ethylene glycol and methanol poisoning . Aspirin poisoning causes metabolic acidosis, and alkalinization can correct acidemia, prevent salicylate from entering the CNS, and increase renal excretion of the drug. Sodium bicarbonate should be used in patients with signs and symptoms of aspirin poisoning or serum salicylate levels of 30 mg/dL or greater. The serum pH and the patient's clinical status should be given equal importance when deciding whether or not to give sodium bicarbonate. Alkalinization is begun by giving 1–2 mEq/kg of 8.4% sodium bicarbonate as a bolus dose. This is followed by a continuous infusion of 100–150 mEq of 8.4% sodium bicarbonate diluted in 1,000 mL of 5% dextrose in water. The rate of the infusion should be titrated to maintain a urine pH of 7.5–8.0. The patient's serum potassium should be measured before beginning alkalinization, because hypokalemia or even a low normal serum potassium level will prevent the therapy from being effective. A dose of 20–40 mEq of potassium chloride may be added to each liter of IV solution, or periodic bolus doses of potassium can be used. Therapy may be stopped when academia is resolved, the patient shows clinical improvement, and/or consecutive serum salicylate levels are <30 mg/dL. Alkalemia and fluid overload are the two primary adverse effects of alkalinization; hypocalcemia and hypokalemia may also occur. Alkalinization with sodium bicarbonate is contraindicated for patients who have cerebral edema, pulmonary edema, or renal failure. Alkalemia caused by a respiratory alkalosis is not a contraindication to the use of sodium bicarbonate to treat aspirin poisoning. Because using sodium bicarbonate to treat cases of aspirin poisoning requires administration of large volumes of IV fluids, this therapy should be cautiously used if a patient has pulmonary edema, congestive heart failure, or renal failure. Sodium bicarbonate is indicated for treating patients who have known or suspected ethylene glycol or methanol poisoning to correct acidemia caused by the toxic alcohols. In these cases, a bolus dose of 12 mEq/kg should be given, followed by a continuous infusion that is titrated to maintain a serum pH >7.3. TCAs (e.g., amitriptyline, nortriptyline) affect sodium ion channels in the myocardium and can cause a quinidine-like effect, slowing depolarization of the myocardium, disrupting cardiac conduction, and causing depressed myocardial function. TCA toxicity can result in serious, fatal arrhythmias and hypotension. Alkalinization with sodium bicarbonate should be used to treat cases of TCA poisoning if the duration of QRS is greater than 100 msec or if there are other signs of cardiovascular toxicity, such as arrhythmias, hypotension, a negative S wave and a positive R wave in lead aVR, or a terminal 40 msec axis of 120° to 270°. It should also be used if there is a significant risk for cardiotoxicity. The recommended dose for TCA toxicity is 1–2 mEq/kg IV of 8.4% sodium bicarbonate delivered as a bolus, repeated as necessary. Success is reflected by a narrowing of the QRS and/or improvement in the patient's clinical status. If the bolus dose is successful, begin a continuous infusion of 150 mEq of sodium bicarbonate in 1,000 mL 5% dextrose in water. The infusion should be titrated to maintain a serum pH between 7.50–7.55. Contraindications to sodium bicarbonate for TCA toxicity include alkalemia and intolerance to a high sodium load or to volume overload (e.g., patients who have congestive heart failure, pulmonary edema, or renal failure). Potential adverse effects include fluid overload, metabolic alkalosis, and electrolyte abnormalities (e.g., hypokalemia, hypernatremia). Sodium thiosulfate is the antidote for cyanide poisoning. It binds to cyanide to form a thiocyanate, and this compound, which is minimally toxic, is excreted renally. The result is a rapid reversal of the toxic effects of cyanide poisoning. Sodium thiosulfate is administered at a dose of 1.65 mL/kg IV of a 25% solution (maximum: 12.5 g) . It should be administered in conjunction with sodium nitrite, with sodium nitrite started first. The rate of infusion depends on the clinical condition of the patient; it can be given as a rapid IV bolus or infused over 10 to 30 minutes. Minor adverse effects are possible and include injection site irritation, muscle cramping, nausea, and vomiting. Will this exposure cause systemic effects? Are there any special treatments that are needed? For most cases of skin, respiratory tract, or ocular poisoning, toxicity is localized, and standard care is sufficient to resolve any adverse effects. For dermal exposures, all contaminated clothing should be removed. The skin is flushed with tepid water for 15 minutes, and then the level of damage can be assessed. If there are burns, provide standard burn care. Patients with inhalational exposures should be moved to fresh air. A thorough assessment will help identify injuries requiring immediate attention. Supportive care, such as bronchodilators and oxygen, is applied as needed. These patients often experience systemic effects, as entrance into the bloodstream is swift. The first step in treating ocular exposures is to carefully remove contact lenses (if present) and flush the eyes for 15 minutes. The flushing can be done at home with tepid water or in a healthcare facility with sterile saline. Flushing as soon as possible after the exposure is much more important than which solution is used; flushing the eyes should not be delayed. If the patient has an ocular abrasion or burn, contact an ophthalmologist. There are some situations in which dermal, inhalational, and ocular exposures may cause systemic toxicity and will require special care. The most common of these are hydrofluoric acid exposures to the skin, which can cause serious electrolyte abnormalities and arrhythmias. In these cases, treatment of the systemic effects should be initiated as soon as possible. Patient A, a girl 14 years of age, is brought to a local emergency department by her parents at 9 p.m. The parents state that 45 minutes prior to arriving they found the patient in her room. She was very upset and stated that she had just taken "a whole bottle of pills." The parents are able to account for their daughter's actions and location since she returned from school at 3 p.m., and they state that during that time she had been awake, alert, and acting normally. She had been alone for only 5 to 10 minutes. The father found an empty bottle of acetaminophen 500-mg tablets in the patient's room. The bottle contained 60 tablets when it was purchased, but neither parent can remember how many tablets were in the bottle before the exposure. They estimate that it might have been half full. Patient A is awake, alert, and oriented to time, place, and person. Her speech is clear. Her vital signs are: temperature 98.3°F; pulse 80 beats per minute and regular; respiratory rate 16 breaths per minute; and blood pressure 112/60 mm Hg. Her skin is warm and dry, and no cyanosis is noted. Her pupils are 5 mm in diameter, and they are equal in size and normally reactive to light. Her chest is clear to auscultation, and her heart tones are normal. She has a normal gag reflex and bowel signs, and her bladder is not distended. She weighs 55 kg. Patient A has a past medical history of bipolar disorder, for which she takes lithium carbonate 300 mg, once in the morning and once in the evening; her last dose was at 9 a.m. today. The medication is given to the patient by the parents, and they are sure that she did not and could not have access to it. The patient has no other medical problems and takes no other medications. Neither parent takes any prescription medications. They state that the only other medication in the house is antacid tablets. Patient A's ABCs are normal, and this is to be expected. Acetaminophen causes delayed onset liver and (occasionally) kidney damage, typically about 24 hours after ingestion. If a patient had taken a massive overdose of acetaminophen, other organ systems could be affected and there would be changes in the ABCs. However, these cases are rare, and even then, it takes time for toxicity to develop. A dose of acetaminophen greater than 7.5 g or 150 mg/kg is considered potentially toxic. It is estimated that Patient A may have taken 15 g or 272 mg/kg. This is a large dose and potentially toxic, but she has presented to the emergency department soon after the ingestion. As such, the dose does not put her at risk for serious derangements of the ABCs. If the ABCs were abnormal, an exposure to another drug or toxin would need to be strongly considered. There is no indication that dextrose, oxygen, naloxone, or thiamine is needed. It appears that the patient ingested only acetaminophen, had no access to any other medications, and the history seems accurate and reliable. The patient takes lithium carbonate, and it is very unlikely that an overdose of this medication was ingested. However, the possibility should be kept in mind. The patient does not have any signs or symptoms of a toxidrome, and the physical exam is normal. As a part of the treatment plan, gastric decontamination is considered. The patient is awake and alert, has a normal gag reflex, and has a normally functioning gastrointestinal tract. It is very unlikely that Patient A's mental status or ability to maintain her airway will deteriorate. There are no contraindications to the use of activated charcoal and it binds very well to acetaminophen, so activated charcoal would be the gastric decontamination technique to use. Syrup of ipecac should never be used, lavage is reserved for patients who have ingested a life-threatening amount of a dangerous drug and/or drug for which there is no effective antidote, and whole bowel irrigation is reserved for drugs that are not adsorbed by activated charcoal or sustained-release preparations. One dose of plain charcoal should be given. Most activated charcoal is available in 50 g doses. NAC is a highly effective antidote for acetaminophen poisoning. It is commonly available, easy to administer, and relatively safe. It can be given any time within eight hours of an acetaminophen overdose and be equally effective; after eight hours, the effectiveness begins to decrease. Patient A may need NAC depending on the amount of drug she took. However, the time of ingestion in this case is known and within eight hours of arrival, so there is no need to give NAC immediately. NAC should be used for acetaminophen poisoning if the patient has ingested a toxic dose, there is evidence of liver damage, or the serum acetaminophen level is toxic. In this case, the dose is unknown, and it is too early to see signs, symptoms, or laboratory evidence of liver damage, so the decision of whether or not to use NAC will depend on the serum acetaminophen level. Hospital laboratories can usually perform and report the results of serum acetaminophen level test within one hour of receiving the blood sample. It is clear a serum acetaminophen level should be obtained, but it must be done four hours or later after the ingestion. If the level is measured sooner, it cannot be reliably interpreted. Interpreting the level as toxic or nontoxic on the basis of the numerical value alone could lead to treatment errors. 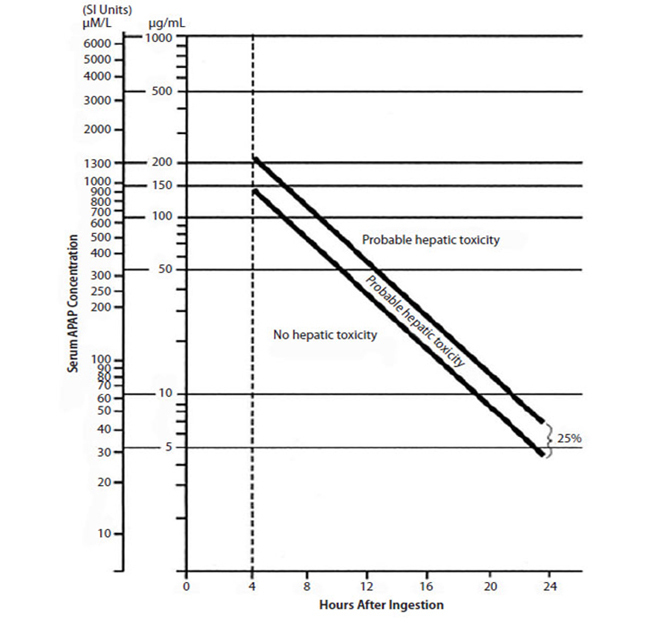 The level and associated risk for hepatotoxicity should be interpreted using the Rumack-Matthew nomogram. Serum hepatic transaminases, BUN, and serum creatinine should also be obtained. Although it is unlikely the patient had access to her lithium, it would be prudent to check a lithium level as well. There is no need for other laboratory tests, an ECG, or imaging studies. In some cases, a serum aspirin level should be checked. It is not unusual for patients to use the terms acetaminophen and aspirin interchangeably. However, because of the particulars of this case study, an aspirin level would not be needed. When an overdose of acetaminophen is taken, the two primary metabolic pathways for the drug become saturated and a third pathway is used. This metabolic pathway produces large amounts of a toxic metabolite, N-acetyl-p-benzoquinoneimine (NAPQI), and it is this metabolite that causes liver and kidney damage. Manipulating the pH of the urine or serum would not affect acetaminophen metabolism or the production of NAPQI, so these techniques are not used. Acetaminophen can be quickly and easily removed with hemodialysis, but hemodialysis has risks. Because there is a highly effective antidote available, hemodialysis or any other type of extracorporeal removal would not be needed. At this point, care of Patient A focuses on monitoring vital signs, arranging a consultation with a mental health professional, maintaining patient safety, and treating with NAC if her acetaminophen level is greater than 150 mcg/mL. Patient B, a man 56 years of age, is brought to the emergency department at 4:30 p.m. His wife called EMS because the patient had reportedly taken an overdose of his prescription medications. According to the EMS personnel, the ingestion was unwitnessed; Patient B had told the wife that he wanted to die and that some time that morning he had "taken all of his pills." The exact time of ingestion is not known, but a reasonable estimate is 10 a.m. The EMS personnel report that they found empty bottles of bupropion, metoprolol, and verapamil (all three sustained-release formulations), and the patient's name was on the bottles. The patient told EMS that he had been drinking vodka and when that ran out, he drank some antifreeze. The EMS personnel did not find any bottles of antifreeze. He has a past history of chronic alcohol abuse, depression, and hypertension. Patient B is awake and alert, but drowsy. His vital signs are: temperature 97.8°F; pulse 44 beats per minute; respiratory rate 16 breaths per minute; and blood pressure 82/38 mm Hg. The cardiac monitor shows sinus bradycardia. His oxygen saturation is 93%, and his bedside serum glucose level is 148 mg/dL. His nail beds are cyanotic, there is no peripheral edema, and his skin is cool and clammy. His pupils are 5 mm and reactive, his lungs are clear, and his heart tones are normal. His abdomen is soft and nontender, and there is no bladder distention. The most immediate need in this situation is to stabilize the ABCs. Supplemental oxygen is applied, and IV access is obtained. It is reasonable to assume that the bradycardia and hypotension are being caused by the metoprolol and verapamil. Atropine, fluids, and vasopressors are seldom effective for the cardiovascular toxicity caused by beta blockers and calcium channel blockers. Those drugs can be tried, but if they do not quickly reverse the bradycardia and hypotension, additional treatment should not be delayed. For Patient B, antidotal care is a top priority. Antidotal care may also be needed to treat ethylene glycol poisoning. The physician administers 10% calcium chloride 10 mL IV over 5 minutes. The dose can be repeated every 10 to 20 minutes, or a continuous infusion can be used. Concurrently, an IV bolus dose of glucagon is given, 5 mg over five minutes. This can be followed (if needed) with a continuous IV infusion at 1–5 mg/hour. If these are unsuccessful, a dextrose-insulin infusion and cardiac pacing are the next steps. Give a bolus dose of regular insulin, 1 Unit/kg, followed by a continuous infusion of regular insulin at 1–10 Units/kg/hour. As the insulin is being given, the patient should receive an IV bolus of 25 g of 50% dextrose. Additional glucose should be given to maintain the serum glucose level of 100–200 mg/dL. Consider giving fomepizole. Antifreeze almost always contains ethylene glycol, but many hospital laboratories are not prepared to measure ethylene glycol levels. If a level cannot be obtained, the decision to use fomepizole will depend on how likely it is the patient ingested ethylene glycol, the patient's arterial blood gases, and if the patient has a large anion gap and/or a large osmolar gap. The risks of fomepizole are slight, and the benefit can be enormous. Patient B's serum glucose is normal, so he does not require dextrose. Supplemental oxygen is started immediately. He does not have signs or symptoms of an opioid poisoning, so naloxone is not appropriate. Although he chronically abuses alcohol, the patient has no signs of Wernicke-Korsakoff syndrome, so thiamine should not be given. The circumstances of the overdose are not very clear, but if Patient B did take the medications and the antifreeze, there is a substantial risk for serious morbidity and death. The time of ingestion is not known with certainty, but it appears that it happened approximately 6.5 hours prior to arrival. Given the patient's clinical condition and the empty bottles of metoprolol and verapamil, it seems reasonable to assume that he took an overdose of these medications and took an intoxicant that can cause CNS depression—in this case, ethanol and/or ethylene glycol. Upon physical examination there is no evidence of a toxidrome, as would be expected. Because the patient has ingested a beta blocker, a calcium channel blocker, ethanol, and a toxic alcohol, the patient should be assessed for signs and symptoms of circulatory compromise, respiratory depression, intoxication, and metabolic acidosis. Circulatory compromise is evident. The patient is drowsy, and this may be due to the bupropion, the ethanol, the ethylene glycol, or a combination of the three. There is no respiratory depression, so Patient B may not have ingested sufficient quantities of the alcohols for this to develop. There are no signs of metabolic acidosis, but this could develop in the next few hours. Laboratory confirmation is needed to detect and confirm an acid-base disturbance. If acidosis is present, it could, in part, explain the CNS depression. Gastric decontamination should not be performed for Patient B. Although the patient has ingested medications and a toxin that can be very dangerous, it has been more than one hour since the ingestion. Also, it could cause the patient's CNS depression to worsen. Any method of gastric decontamination would put the patient at risk for aspiration and/or worsening of his cardiac status and would probably not be useful. Measurement of Patient B's serum acetaminophen level, serum ethanol level, and serum ethylene glycol level should be attempted. Blood levels of bupropion, metoprolol, and verapamil can be done, but they cannot be obtained immediately and would not be useful in caring for the patient. Obtain electrolytes to look for an anion gap, assess arterial blood gases to check for an acid-base disturbance, and request a serum osmolarity to look for an osmolar gap. A 12-lead ECG should be done, and the patient should be on continuous cardiac monitoring. Urinalysis should also be ordered. Ethylene glycol metabolism produces oxalate crystals in the urine, which could help confirm the diagnosis. Bupropion, metoprolol, and verapamil cannot be removed by dialysis or hemoperfusion nor can their elimination be enhanced by manipulating the pH of the urine. However, hemodialysis is very effective at removing ethylene glycol and the toxic aids produced by ethylene glycol metabolism. A nephrologist should be notified of the possible need for hemodialysis. The number of patients who overdose each year is relatively small, but not insignificant. There are tens of thousands of overdose cases and toxic exposures in the United States annually. The experience of most poison control center personnel is that many nurses would benefit from a basic knowledge of toxicology and the information necessary to provide good care for the poisoned patient. This course has provided an overview of the most common poisoning emergencies and their treatments. By applying this information to one's practice, these cases can be identified and treated early, resulting in better outcomes and improved patient care. 1. Gummin DD, Mowry JB, Spyker DA, Brooks DE, Fraser MO, Banner W. 2016 annual report of the American Association of Poison Control Centers' National Poison Data System (NPDS): 34th annual report. Clin Toxicol (Phila). 2017;55(10):1072-1252. 2. Hoffman RS, Howland MA, Lewin NA, Nelson LS, Goldfrank LR. Initial evaluation of the patient: vital signs and toxic syndromes. In: Hoffman RS, Howland MA, Lewin NA, Nelson LS, Goldfrank LR (eds). Goldfrank's Toxicologic Emergencies. 10th ed. New York, NY: McGraw-Hill; 2015: 26-39. 3. Olson KR. Comprehensive evaluation and treatment. In: Olson KR, Anderson IB, Benowitz NL, et al. (eds). Poisoning and Drug Overdose. 6th ed. New York, NY: McGraw-Hill Lange; 2012: 1-68. 4. Sivilotti MLA. Initial Management of the Critically Ill Adult with an Unknown Overdose. Available at https://www.uptodate.com/contents/initial-management-of-the-critically-ill-adult-with-an-unknown-overdose. Last accessed March 8, 2018. 5. Rhyee SH. General Approach to Drug Poisoning in Adults. Available at https://www.uptodate.com/contents/general-approach-to-drug-poisoning-in-adults. Last accessed March 8, 2018. 6. McGregor T, Parkar M, Rao S. Evaluation and management of common childhood poisonings. Am Fam Physician. 2009;79(5): 397-403. 7. Braitberg G, Oakley E. Small dose.big poison. Aust Fam Physician. 2010;39(11):826-833. 8. Bartlett D. Tricky toxic presentations at triage. J Emer Nurs. 2005;31(4):403-404. 9. Bang HI, Jang MA, Lee YW. Evaluation of the Triage TOX DRUG Screen Assay for detection of 11 drugs of abuse and therapeutic drugs. Ann Lab Med. 2017;37(6):522-525. 10. Monte AA, Heard KJ, Hoppe JA, Vasiliou V, Gonzalez FJ. The accuracy of self-reported drug ingestion histories in emergency department patients. J Clin Pharmacol. 2015;55(1):33-38. 11. Kreshak AA, Wardi G, Tomaszewski CA. The accuracy of emergency department medication history as determined by mass spectrometry analysis of urine: a pilot study. J Emerg Med. 2015;48(3):382-386. 12. Bartlett D. Drug-induced serotonin syndrome. Crit Care Nurse. 2017;37(1):49-54. 13. Petrie PM. Laboratory principles. In: Hoffman RS, Howland MA, Lewin NA, Nelson LS, Goldfrank LR (eds). Goldfrank's Toxicologic Emergencies. 10th ed. New York, NY: McGraw-Hill; 2015: 62-76. 14. Moeller KE, Kissack JC, Atayee RS, Lee KC. Clinical interpretation of urine drug tests: what clinicians need to know about urine drug screens. Mayo Clin Proc. 2017;92(5):774-796. 15. Christian MR, Lowry JA, Algren DA, Thornton SL, Deng S, Garg U. Do rapid comprehensive urine drug screens change clinical management in children? Clin Toxicol (Phila). 2017;55(9):977-980. 16. Tenenbein M. Do you really need that emergency drug screen? Clin Toxicol (Phila). 2009;47(4):286-291. 17. Manini AF, Nair AP, Vedanthan R, Vlahov D, Hoffman RS. Validation of the prognostic utility of the electrocardiogram for acute drug overdose. J Am Heart Assoc. 2017;6(2). 18. CredibleMeds. Overview of Long QT Syndrome and Torsades de Pointes. Available at https://www.crediblemeds.org/healthcare-providers/practical-approach. Last accessed March 8, 2018. 19. Li M, Ramos LG. Drug-induced QT prolongation and torsades de pointes. P T. 2017;42(7):473-477. 20. Eliason MJ, Ricca RL, Gallagher TQ. Button battery ingestion in children. Curr Opin Otolaryngol Head Neck Surg. 2017;25(6): 520-526. 21. Schwartz DT. Diagnostic imaging. In: Hoffman RS, Howland MA, Lewin NA, Nelson LS, Goldfrank LR (eds). Goldfrank's Toxicologic Emergencies. 10th ed. New York, NY: McGraw-Hill; 2015: 38-61. 22. Bahrami-Motlagh H, Mahboubi-Fooladi Z, Salevatipour B, Hassanian-Moghaddam H, Mirhashemi SH. Comparison of low dose and standard dose abdominal CT scan in body stuffers. Clin Toxicol (Phila). 2017:1-7. 23. Esterson YB, Patel V, Nicastro J, Friedman B. Plain radiography may underestimate the burden of body packer ingestion: a case report. Clin Imaging. 2017;44:57-60. 24. Yamamoto T, Malavasi E, Archer JR, Dargan PI, Wood DM. Management of body stuffers presenting to the emergency department. Eur J Emerg Med. 2016;23(6):425-429. 25. Gude A-BJ, Hoegberg LCG. Techniques use to prevent gastrointestinal absorption. In: Hoffman RS, Howland MA, Lewin NA, Nelson LS, Goldfrank LR (eds). Goldfrank's Toxicologic Emergencies. 10th ed. New York, NY: McGraw-Hill; 2015. 26. Hendrickson RG, Kusin S. Gastrointestinal Decontamination of the Poisoned Patient. Available at https://www.uptodate.com/contents/gastrointestinal-decontamination-of-the-poisoned-patient. Last accessed March 8, 2018. 27. Pfab R, Schmoll S, Dostal G, Stenzel J, Hapfelmeier A, Eyer F. Single-dose activated charcoal for gut decontamination: application by medical non-professionals: a prospective study on availability and practicability. Toxicol Rep. 2016;4:49-54. 28. Juurlink DN. Activated charcoal for acute overdose: a reappraisal. Br J Clin Pharmacol. 2016;81(3):482-487. 29. Chyka PA, Seger D, Krenzelok EP, et al. Position paper: single-dose activated charcoal. Clin Toxicol (Phila). 2005;43(2):61-87. 30. De Weerdt A, Snoeckx A, Germonpré P, Jorens PG. Rapid-onset adult respiratory distress syndrome after activated charcoal aspiration: a pitch-black tale of a potential to kill. Am J Respir Crit Care Med. 2015;191(3):344-345. 31. Bairral BQ, Saito M, Morrone N. Activated charcoal bronchial aspiration. J Bras Pneumol. 2012;38(4):533-534. 32. [No authors listed]. Position paper: cathartics. J Toxicol Clin Toxicol. 2004;42(7):243-253. 33. Höjer J, Troutman WG, Hoppu K, et al. Position paper update: ipecac syrup for gastrointestinal decontamination. Clin Toxicol (Phila). 2013;51(3):134-139. 34. American Academy of Pediatrics Committee on Injury, Violence, and Poison Prevention. Poison treatment in the home. Pediatrics. 2003;112(5):1182-1185. 35. Manoguerra AS, Cobaugh DJ; Guidelines for the Management of Poisoning Consensus Panel. Guideline on the use of ipecac syrup in the out-of-hospital management of ingested poisons. Clin Toxicol (Phila). 2005;43(1):1-10. 36. Thanacoody R, Caravati EM, Troutman B, et al. Position paper update: whole bowel irrigation for gastrointestinal decontamination of overdose patients. Clin Toxicol (Phila). 2015;53(1):5-12. 37. Gerardo CJ, Quackenbush E, Lewis B, et al. The efficacy of crotalidae polyvalent immune fab (Ovine) antivenom versus placebo plus optional rescue therapy on recovery from copperhead snake envenomation: a randomized, double-blind, placebo-controlled, clinical trial. Ann Emerg Med. 2017;(2):233-244. 38. CroFab [Package Insert]. Available at https://www.crofab.com/CroFab/media/CroFab/PDF%20Files/CroFab-Full-Prescribing-Information-2017.pdf. Last accessed March 8, 2018. 39. Dong H, Weng YB, Zhen GS, Li FJ, Jin AC, Liu J. Clinical emergency treatment of 68 critical patients with severe organophosphorus poisoning and prognosis analysis after rescue. Medicine (Baltimore). 2017;96(25):e7237. 40. Bird S. Organophosphate and Carbamate Poisoning. Available at https://www.uptodate.com/contents/organophosphate-and-carbamate-poisoning. Last accessed March 8, 2018. 41. Graudins A, Lee HM, Druda D. Calcium channel antagonist and beta-blocker overdose: antidotes and adjunct therapies. Br J Clin Pharmacol. 2016;81(3):453-461. 42. St-Onge M, Anseeuw K, Cantrell FL, et al. Experts consensus recommendations for the management of calcium channel blocker poisoning in adults. Crit Care Med. 2017;45(3):e306-e315. 43. Rietjens SJ, de Lange DW, Donker DW, Meulenbelt J. Practical recommendations for calcium channel antagonist poisoning. Neth J Med. 2016;74(2):60-67. 44. Barrueto F Jr. Beta Blocker Poisoning. Available at https://www.uptodate.com/contents/beta-blocker-poisoning. Last accessed March 8, 2018. 45. Han HH, Kwon BY, Jung SN, Moon SH. Importance of initial management and surgical treatment after hydrofluoric acid burn of the finger. Burns. 2017;43(1):e1-e6. 46. Liebelt EL. Acute Iron Poisoning. Available at https://www.uptodate.com/contents/acute-iron-poisoning. Last accessed March 8, 2018. 47. Pincus M. Management of digoxin toxicity. Aust Prescr. 2016;39(1):18-20. 48. Chan BS, Buckley NA. Digoxin-specific antibody fragments in the treatment of digoxin toxicity. Clin Toxicol (Phila). 2014;52(8):824-836. 49. Bartlett D. β-blocker and calcium channel blocker poisoning: high-dose insulin/glucose therapy. Crit Care Nurse. 2016;36(2):45-50. 50. Page CB, Ryan NM, Isbister GK. The safety of high-dose insulin euglycaemia therapy in toxin-induced cardiac toxicity. Clin Toxicol (Phila). 2017: [Epub ahead of print]. 51. Engebretsen KM, Kaczmarek KM, Morgan J, Holger JS. High-dose insulin therapy in beta-blocker and calcium channel-blocker poisoning. Clin Toxicol (Phila). 2011;49(4):277-283. 52. Hamad E, Babu K, Bebarta VS. Case files of the University of Massachusetts Toxicology Fellowship: does this smoke inhalation victim require treatment with cyanide antidote? J Med Toxicol. 2016;12(2):192-198. 53. Desai S, Su M. Cyanide Poisoning. Available at https://www.uptodate.com/contents/cyanide-poisoning. Last accessed March 8, 2018. 54. An H, Godwin J. Flumazenil in benzodiazepine overdose. CMAJ. 2016;188:17-18. 55. Singh R, Arain E, Buth A, Kado J, Soubani A, Imran N. Ethylene glycol poisoning: an unusual cause of altered mental status and the lessons learned from management of the disease in the acute setting. Case Rep Crit Care. 2016;2016:9157393. 56. Mock CM, Schwetschenau KH. Levocarnitine for valproic-acid-induced hyperammonemic encephalopathy. Am J Health Syst Pharm. 2012;69(1):35-39. 57. Perrott J, Murphy NG, Zed PJ. L-carnitine for acute valproic acid overdose: a systematic review of published cases. Ann Pharmacother. 2010;44(7-8):1287-1293. 58. Gosselin S, Hoegberg LC, Hoffman RS, et al. Evidence-based recommendations on the use of intravenous lipid emulsion therapy in poisoning. Clin Toxicol (Phila). 2016;54(10):899-923. 59. Bartlett D. Intravenous lipids: antidotal therapy for drug overdose and toxic effects of local anesthetics. Crit Care Nurse. 2014;34(5):62-66; quiz 67. 60. Hayes BD, Gosselin S, Calello DP, et al. Systematic review of clinical adverse events reported after acute intravenous lipid emulsion administration. Clin Toxicol (Phila). 2016;54(5):365-404. 61. Katabami K, Hayakawa M, Gando S. Severe methemoglobinemia due to sodium nitrite poisoning. Case Rep Emerg Med. 2016;2016:9013816. 62. Bailey GP, Najafi J, Elamin ME, et al. Delays during the administration of acetylcysteine for the treatment of paracetamol overdose. Br J Clin Pharmacol. 2016;82(5):1358-1363. 63. Chiew AL, Isbister GK, Kirby KA, Page CB, Chan BSH, Buckley NA. Massive paracetamol overdose: an observational study of the effect of activated charcoal and increased acetylcysteine dose (ATOM-2). Clin Toxicol (Phila). 2017;55(10):1055-1065. 64. McNulty R, Lim JME, Chandru P, Gunja N. Fewer adverse effects with a modified two-bag acetylcysteine protocol in paracetamol overdose. Clin Toxicol (Phila). 2017: [Epub ahead of print]. 65. Rzasa Lynn R, Galinkin JL. Naloxone dosage for opioid reversal: current evidence and clinical implications. Ther Adv Drug Saf. 2018;9(1):63-88. 66. Klein-Schwartz W, Stassinos GL, Isbister GK. Treatment of sulfonylurea and insulin overdose. Br J Clin Pharmacol. 2016;81(3): 496-504. 67. Dawson AH, Buckley NA. Pharmacological management of anticholinergic delirium: theory, evidence and practice. Br J Clin Pharmacol. 2016;81(3):516-524. 68. Walton EL. Pralidoxime and pesticide poisoning: a question of severity? Biomed J. 2016;39(6):373-375. 69. Stead DF, Mason CR. Three cases of intentional isoniazid overdose: a life-threatening condition. S Afr Med J. 2016;106(9):891-892. 70. Howland MA. Antidotes in depth: pyridoxine. In: Nelson LS, Lewin NA, Howland MA, Hoffman RS, Goldfrank LR, Flomenbaum NE (eds). Goldfrank's Toxicologic Emergencies. 9th edition. New York, NY: McGraw-Hill; 2011: 845-848. 71. Mirrakhimov AE, Ayach T, Barbaryan A, Talari G, Chadha R, Gray A. The role of sodium bicarbonate in the management of some toxic ingestions. Int J Nephrol. 2017;2017:7831358. 72. Shoma D, Su M. Cyanide Poisoning. Available at https://www.uptodate.com/contents/cyanide-poisoning. Last accessed March 8, 2018. 1. O'Driscoll BR, Howard LS, Earis J, Mak V, British Thoracic Society Emergency Oxygen Guideline Group, BTS Emergency Oxygen Guideline Development Group. BTS guideline for oxygen use in adults in healthcare and emergency settings. Thorax. 2017;72(Suppl 1):ii1-ii90. Summary retrieved from National Guideline Clearinghouse at https://www.guideline.gov/summaries/summary/51061. Last accessed March 16, 2018. 2. Assessment and Management of Risk for Suicide Working Group. VA/DoD Clinical Practice Guideline for Assessment and Management of Patients at Risk for Suicide. Washington, DC: Department of Veterans Affairs, Department of Defense; 2013. Summary retrieved from National Guideline Clearinghouse at https://www.guideline.gov/summaries/summary/47023. Last accessed March 16, 2018.